Perfect Retreat perheille ja ystäville! Katsele kaupunkia Mtn-puolelta! Jane n Lodge Suosittuja Lomakoti! Ihanteellinen paikka oman tapaamisia ja Large Group Vacation! Denverin perheet! : Jaa tämä vuokra ystävillesi! Kausi- ja kuukausivuokrat ovat saatavilla! Jos olet ollut Breckenridge ... olet nähnyt tämän kotiin; kyydissä yläpuolella kaupungin kanssa täydellisin näkemykset tuikkivat valot Breckenridge. Ski Hill Lodge on järjestänyt häävieraat, yritysten kokoukset, MM-hiihtäjät, perhejuhlia, pro-pyöräilijöitä, retkiä. Denverin viikonlopun soturit ovat varanneet tämän lomakkeen kausittain ja kuukausittain. Suuri loma-asunnon asettelua. Täynnä mukavuuksia. 65 jalka pitkä kannella! Vain 1 1/2 korttelin ski shuttle (alle 5 minuutin kävelymatka); ja aivan pyörä / jalankulkija polku. Täydellinen jättää ja suuri joukko ihmisiä! Tämä koti toimi eurooppalaisena ruokapaikkana ... Nyt saatavilla yksityisille vuokrille !!! Yksityinen Chef; Kelly Brenholt, saatavilla tämän kotiin! Tämä on yksi viidestä yksityisestä kodistamme; Käy sivuillamme ja löydä täydellinen loma, joka sopii lomasi tarpeisiin. Very nice property. Good convenient location. Well accommodated. Property owner and manager very responsive to issues that came up. Mattress replacement done promptly. Hair dryers replaced promptly. Amenities quite good. Baby pack n play, playpen for baby, games for kids. The latter enjoyed hot tub especially. Great House, Great Location ... the Perfect "Home Away From Home"! Wonderful property for a family reunion! Plenty of beds for everyone. The large great room, spacious outdoor deck and dining room table that seated the entire family (18 of us) were all perfect. Kitchen was a plus as well with 2 ranges and 2 dishwashers. Everything was clean and the house was stocked with all the necessities. Did I mention the location? Perfect as well ... a quick walk to Main St and a nice hike back home. Thank you for making our first family reunion a huge success! ***Only issue was the lack of AC on the warmer days .. but cooled down quickly at night!! Great breezes through the open doors and windows. While the owner was slow to respond to requests everything worked out well and the place was amazing and priced well for our group. I would stay again. Hi Chad; I regret if my timing was off during your stay. Between Tom and myself; we try to tend to any needs promptly. This is one of the infrequent side-effects of operating small. I have used the Ski Hill Lodge around 4 times for a family reunion and multiple corporate team builds. The lodge is spacious and has a great kitchen and a dinning room table so big parties can eat together. The location is great as well. Seemed everything we wanted to do or needed was 5 minutes away. The front yard provided a great space for team building activities and everyone had there own room so they could relax at the end of the day. Overall one of the best spots in Breck and I would highly recommend! Best house I've rented in Breck! Over the past 15 years, I have rented 7-9 different houses in Breckenridge and this is my absolute favorite. Its proximity to main street combined with its amazing views straight from the back deck make it the perfect location. We had a multiple families at the house and every kid was still able to have their own room. Many of the guests were able to go mountain biking straight from the house without ever riding the same trail twice during our week long stay. The walk to downtown for some meals and shopping was short and convenient. 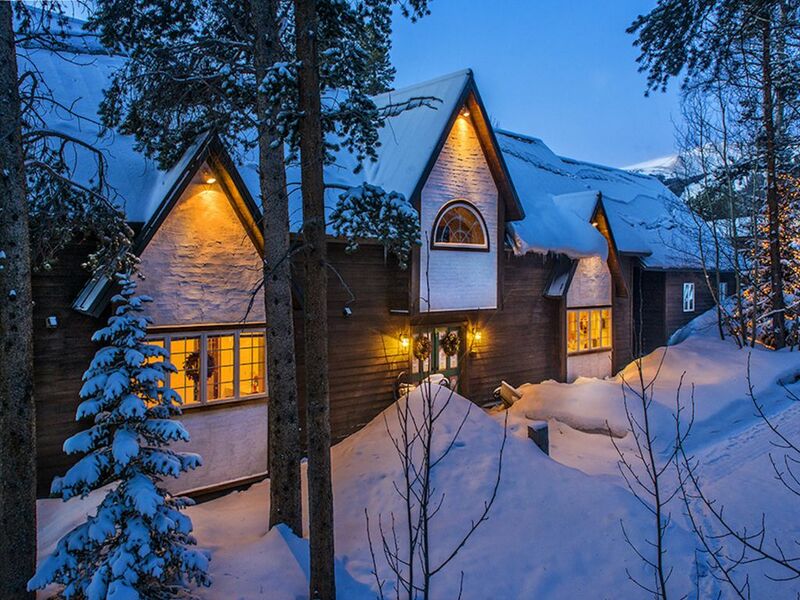 I would recommend this house to anyone wanting to stay in Breck during any season of the year. Jane was awesome and will definitely receive our business again! First time to Breck hosting customers and Jane was exceptional. I was nervous as the house wasn't slopeside, didn't matter. Easy and short walk to bus stop, short bus ride to bottom of peak 8 where we short walked into ski rental shop. It was so easy to get on slopes with my group. House had loads of beds, bedrooms and bathrooms. Kitchen is spacious and easy for cooking big meals fast. Our guests loved the view of downtown Breck from the porch. House was clean and ready for us. Very short drive into Breck for evening fun.